Article 8-A. Average time to complete: Less than 2 minutes. Nope, it's not magic, though sometimes it certainly feels like it! Before you even notice you need to order more vaccines, a shipment shows up on your doorstep, containing exactly the vaccines you need! Here at VaxCare, we call this Automatic Vaccine Replenishment, or AVR for short. Automatic Vaccine Replenishment (AVR) is a series of algorithms that predicts vaccine usage based on your administration history and seasonal changes. 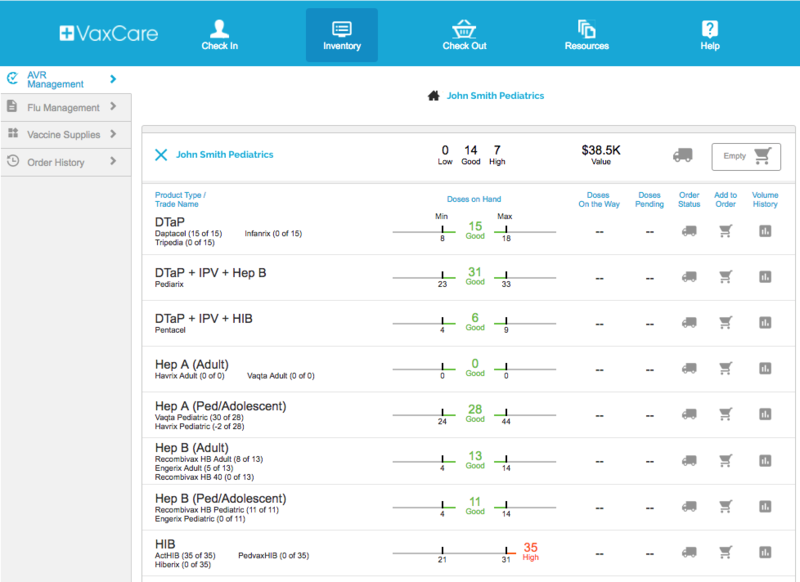 The Inventory tab in your VaxCare Portal shows you how AVR is working on you behalf and allows you to engage in the ordering process if necessary. MIN: AVR targets a minimum supply of 3 weeks for each product. Minimums are adjusted throughout the year based on seasonality. As you near that minimum reorder point, the system ships your practice vaccine to keep you perfectly stocked automatically. Max: If you ever have more vaccine than necessary hang tight. AVR will stop shipping and wait for that vaccine to get used up before ordering more. Existing Partner: VaxCare keeps a record of your vaccine administration history. This history informs the min and max that's been set for each product. You have access to view your volume history for the past 12 weeks. New Partner: If you're a new Partner VaxCare takes into account the size of your practice, your class of trade, and the season. The longer you work with VaxCare the smarter AVR becomes. AVR will take care of the majority of your ordering needs. However, there will be occasions where you need to notify VaxCare of special needs that your practice might have. Click the shopping cart next to the needed antigen and notify us that you'd like to place a special order. Once an antigen has been added to your shopping cart, proceed to the Request Orders section and complete your Requested Order [THIS DOES NOT mean a shipment is on it's way]. Partner placed orders will be approved by VaxCare's Inventory Department and you will be notified by email when the approval process is complete. Low: You shouldn't see inventory low. If you do, first check to see if any doses are pending or on the way. If no orders are pending or on the way, the go ahead and "Add To Order" to request additional vaccines. High: Your inventory is higher than AVR recommends. No action is required. AVR will hold from shipping additional inventory until you begin using more. When Should I Order Vaccines Myself? If you expect a rapid upswing in usage not related to a seasonal increase, you'll need to place an order outside of AVR. Examples include: Hosting a vaccine clinic at your office, starting the back-to-school rush early (before June), or adding a new provider to your practice. In all of these examples, you plan to give significantly more vaccines than your normal pattern of usage, so our team will ship you extra vaccines to give AVR time to "catch up" to your new normal. Follow the instructions above to place an order! Otherwise, sit back and let AVR take care of your inventory. When should you place your own vaccine order?